It’s common knowledge that the Monterey Bay has one of the most beautiful coastlines on the entire planet. But with all those miles of photo-worthy shore, how can you tell which beach is right for you? Central Coast Living’s team has visited them all and here are a few of our favorites! Located off of Highway 1, just south of Carmel is Carmel River State Beach. With a lagoon formed by the Carmel River, this California State Park attracts a large number of migratory birds, making it a great place for birders. Also providing access to notable kelp forests in the area, the beach is a hotspot for scuba divers and kayakers as well. Not the best place for swimming due to its strong currents, beautiful Carmel River State Beach is better suited for a day in the sand or cozying up to warm fire for s’mores in the evening. Just a mile north of Carmel River Beach, within charming Carmel-By-The-Sea, is Carmel Beach. Renowned for good surf, soft sand and excellent dog-walking conditions Carmel Beach is a favorite spot for locals and visitors alike. Perfect for sandcastle building, it’s no wonder that Carmel Beach annually hosts a beloved sandcastle contest as well as the Sunshine Freestyle Surfabout, one of California’s longest running surf contests. Even better than the sand under your feet are the evening sunsets painted where the sky meets the sea. 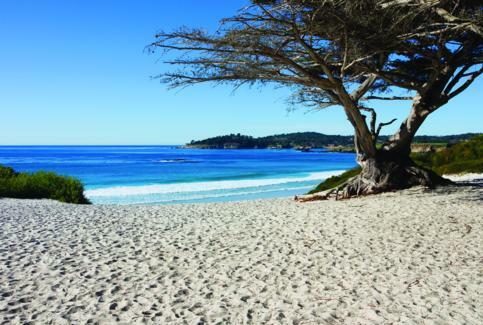 Carmel Beach is also an ideal spot for bonfires and evening picnics. Spanning from Monterey to Seaside, the Monterey State Beach offers a long uninterrupted stretch of sand and surf beginning next to historic Fisherman’s Wharf and ending in Seaside. This popular beach is the perfect place for many outdoor activities, such as surfing, kayaking, swimming, kite flying and even fishing. Look toward the sea and you’ll spot scuba divers emerging from the depths. Look toward the sky and you’ll find hang gliders soaring over the dunes. Perfect for everyone, Monterey State Beach is a great place for a true California beach experience. This next beach packs a whole lot of beautiful views and natural diversity into a single mile of coastline. Providing public access to the Monterey Peninsula’s rocky coastline and dune habitat, Asilomar State Beach is a popular spot for every beach activity from nature walks and surfing to a romantic date night. With a quarter-mile long trail running through the dunes, Asilomar is the perfect place to take in breathtaking views or go for a morning jog. Explore the little worlds hiding within Asilomar’s many tide pools or set up shop for an evening bonfire. A fully accessible beach, Asilomar State Park features beach wheelchairs to allow full access to those with limited mobility. Dog friendly and child-friendly alike, Asilomar is a great family beach. One of Pacific Grove’s most beloved landmarks, Lovers Point Beach is a favorite for both P.G. natives and visitors alike. With a safely protected seashore perfect for children, a rec trail wrapping around the iconic coastline, and lovely Lovers Point Park overlooking the rugged Pacific, Lovers Point is the perfect beach destination for families and visitors of all ages. Enjoy a game of volleyball while overlooking the water, or bring your children to play in the Lovers Point Children’s Pool. Enjoy a run on the rec trail or take your dog for a walk with a view. Featuring bike, surrey and kayak rentals during the high season, Lovers Point has been named Best Place for a Wedding for several years running. So if you are looking for the perfect blend of romance and family fun, look no further than Lovers Point Beach and Park. From small hidden beaches and long stretches of shoreline to rocky points and quiet tide pools, Monterey Peninsula’s cost offers something for everyone. 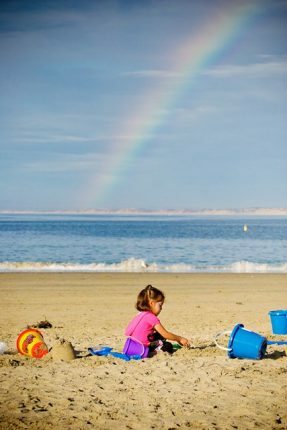 The next time you visit Monterey, discover how many things there are to do at the beach!